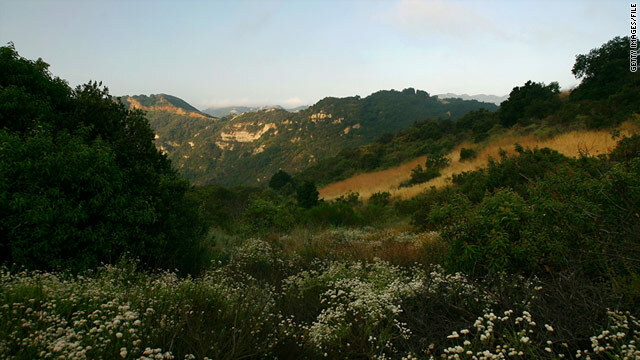 Topanga is a Golden State sampler of rugged mountains, shady creeks and cold, salty surf. Brendan Newnam hosts a national public radio show called The Dinner Party Download produced by American Public Media. He's the author of a new CNN.com travel column called "The State I'm In." Follow him on Twitter @bnewnam. Topanga, California (CNN) -- If you have Neil Young's "After the Gold Rush" on your computer, you should play it while you read this. If you have it on vinyl, even better. Young, one of the great singer-songwriters, recorded and wrote much of this album in Topanga Canyon, an eye blink of a community just west of Los Angeles in the Santa Monica Mountains. Visitors can take the area's measure by driving Topanga Canyon Boulevard, an arc of road that stretches from the San Fernando Valley to the Pacific Ocean. "After the Gold Rush" makes a great soundtrack for a day or two in Topanga. It's not only locally grown, but its blend of approachable folk and head-nodding rock captures the vibe of this unincorporated community. And if you visit Topanga, get used to words like "vibe." Young recorded the album in the Canyon in 1970, smack dab in the era people commonly associate with Topanga (and not incorrectly). You can still buy Native American mukluk boots at one of two vintage shops in the little town. Long hair and environmental bumper stickers abound. At Pat's Grill, the local breakfast burrito and patty melt spot, two business cards on the counter capture the town's champagne-hippie feel: Bruce Gold - Spiritual Healer and Topanga Pet Resort. But it's not all Subarus and yoga in the canyon. It's pickup trucks and manual labor, too. It's sculptors and surfers (of both the couch and ocean variety). And, yes, being that it's a sylvan paradise a short commute from Hollywood, it has its share of big shots in big houses whose kids wear fedoras and bomber jackets and smoke cigarettes in the parking lots of the two strip malls that make up Topanga's shopping district. Topanga's bohemian ethos existed long before Neil Young felt like getting high here. Folk musician and activist Woody Guthrie kept a shack and strummed his "fascist killing machine" at what is now known as Theatricum Botanicum -- a woodsy theater compound centered around a 299-seat outdoor amphitheater. Founded by Will Geer, aka "Grandpa" from "The Waltons," its name means "Theater of Plants." To this day you can visit the garden that Geer planted. It is made up of botanicals and flowers found in the works of Shakespeare. The vibrant theater grounds and ornamental garden are the happy legacy of an unhappy time. Geer originally moved to the Canyon in the '50s after being blacklisted by Sen. Joseph McCarthy. He started growing vegetables to support his family and established the theater to give blacklisted actors a place to perform. Up the road from the Theatricum sits the romantic Inn of the Seventh Ray, serving the fanciest food in town. The Seventh Ray specializes in organic food and vibes of the good variety. The restaurant was supposedly built on the site of the summer home of Aimee Semple McPherson, aka Sister Aimee, a popular faith healing L.A. evangelist in the '20s who pioneered the use of radio. Now the space tries faith healing of a different sort. The stated mission of the restaurant is to not only fill your belly with organic cuisine but also to have you "rest unhurried and partake of the angelic vibrations of the violet ray, to experience a timelessness of what can become the coming culture of a new golden age." Geer and McPherson are but two of the long list of free spirits and artists who have called Topanga home. L.A. beatnik Wallace Berman resided there (he's in the second row on the Beatles' "Sgt. Pepper's Lonely Hearts Club Band" cover). Joni Mitchell, Marvin Gaye, Chris Robinson from the Black Crowes, Stephen Stills, Taj Mahal, Alice Cooper and Adam Jones from Tool are all former residents. As much as the hippie ethos lives on in Topanga, its hold on the popular imagination was overshadowed by an occasional Canyon dweller named Charles Manson. One of the Manson family's first victims was Topanga resident Gary Hinman. That killing was the beginning of Manson's murderous rampage, and in many ways marked the beginning of the end for the hippie era. Culture in the Canyon these days revolves around music at Abuelitas, art at the Topanga Canyon Gallery and occasional house parties and hootenannies at the homes of its colorful residents. Wise advice. Two hands are required while zig-zagging along Topanga Canyon Boulevard. And if it feels like you're driving in a gorgeous car commercial, that's because a lot of them were shot where you're driving. Motorcyclists, too, are fans of the rugged views and dramatic ascent and descent. When you stop off at Froggy's for a cold beer at around the midpoint of your journey, you'll often see motorcycle helmets sitting shotgun to their owners on the outside patio overlooking Topanga Creek. You might be tempted to wear the helmets if you sit too close to the hummingbird feeder, which must be filled with whatever is the equivalent of cold beer on a hot day for birds. Why did they all come to Topanga? The musicians, the actors, the weirdos, the hummingbirds? Nature. Surrounded by parks, conservancy land and the Pacific Ocean, Topanga is a Golden State sampler of rugged mountains, shady creeks and cold, salty surf. People ride horses through it. Mountain bike in it. Hike it. In just under an hour you can disappear into the shade and raw beauty of the canyon and then come out the other end overlooking the Pacific. From there you can head next door to scope celebrities in Mailbu or continue 15 miles up the beach to Zuma, a whole other vibe and the title of another Neil Young album worth listening to. Froggy's Topanga Fish Market 1105 N. Topanga Canyon Blvd. Pat's Grill 1861 N. Topanga Canyon Blvd. The Inn of the Seventh Ray 128 Old Topanga Canyon Rd. Abuelitas 137 S. Topanga Canyon Blvd. The Canyon Bistro 120 N. Topanga Canyon Blvd. Cafe Mimosa 395 S. Topanga Canyon Blvd. The Will Geer Theatricum Botanicum 1419 N. Topanga Canyon Blvd. Topanga Canyon Gallery 120 N. Topanga Canyon Blvd.